Grace and Grandeur - Soaring ceilings, easy flowing floor plan, and lush native surroundings make this builder's own home in Sammamish a delightful respite of Northwest living. Craftsman-inspired architecture combines elegant finishes and dramatic spaces to create a residence that is warmly inviting, yet modern in daily livability. Multi-purpose spaces create an atmosphere that is luxurious and adaptable to a variety of lifestyles. New 96% efficiency furnace, 25 year treated cedar shake roof. 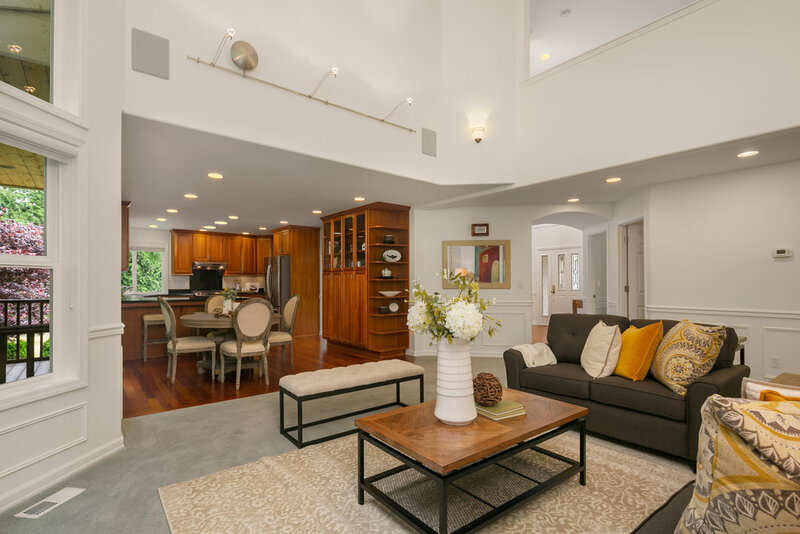 Soaring ceilings, an easy flowing open floor plan and lush native surroundings make this Lake Sammamish home a delightful example of contemporary Northwest living. Timeless Craftsman-inspired architecture combines with elegant interior finishes and dramatic volumes of space to create a residence that is at once warmly inviting, yet modern in its daily livability. Inside, an open and airy foyer leads into the primary living areas, and offers easy access to the dramatic central staircase. The main level of the house is comprised of formal living and dining rooms, an eat-in gourmet kitchen, a spacious home office, a powder room and a dramatic two-story great room, with a wing to the side that contains the spacious master suite and laundry area. 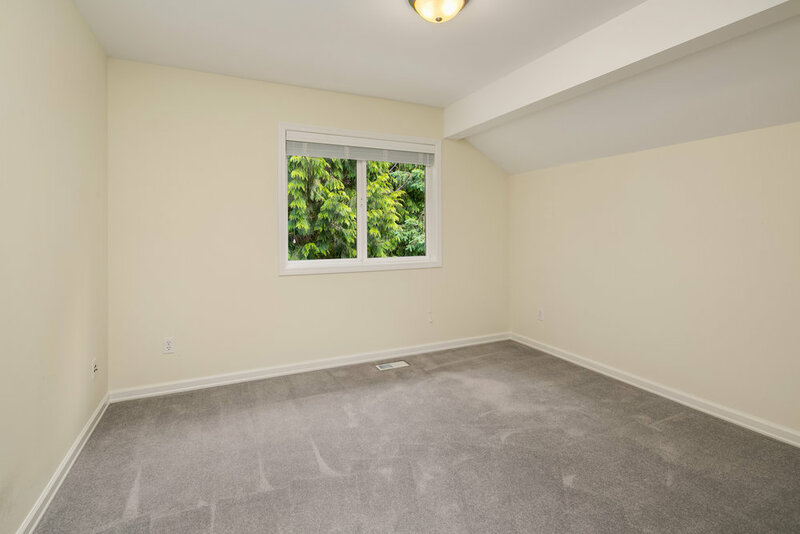 Upstairs, an expansive multi-purpose landing overlooks the foyer and great room, and leads the way to two large bedrooms that share a full bath, with numerous storage closets for linens and household goods. An extra-large three-car garage completes the layout of this open and airy floor plan. The entry sets the stage for a house that is resplendent in natural light and airy volume. Its two-story height opens directly onto the dramatic, diagonally placed central staircase that is illuminated by a huge skylight, and continues into a formal living room that is awash in light and garden views from its bay window. Vaulted ceilings continue this sense of soaring space into the private and spacious den area, where custom cherry built-ins for books and storage stretch from floor to ceiling. Elegant wainscoting is installed throughout the main floor for contrast and to compliment formal window, door and crown molding, with rich cherry hardwoods in the kitchen, casual dining and entry areas. The great room is located toward the back of the house, and features two-story ceilings with low voltage lighting and a cherry and granite fireplace mantel set into a bay of floor-to-ceiling windows that overlook the back yard and surrounding nature. It is attached to the kitchen by a casual dining area that opens onto a spacious deck, and offers views to the second floor landing. An elegantly appointed powder room and a gracious formal dining room with wainscoting and crown molding complete the public areas of the main level. The kitchen is a gourmet’s delight, with three walls of custom cherry cabinetry, ogee edged slab granite counters and ample recessed lighting. A corner window provides light and views above the sink, while a suite of top-of-line stainless steel appliances includes gas cooking and a French door refrigerator. 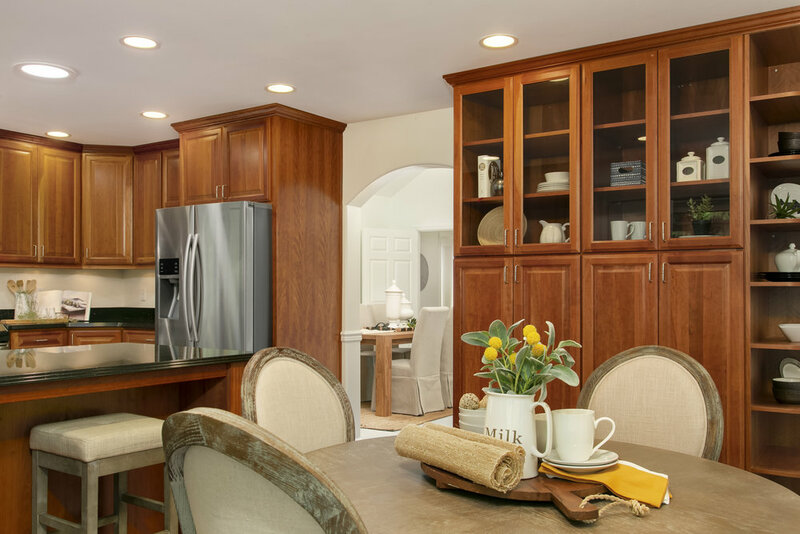 A matching cherry built-in provides plenty of space for pantry storage, china and display, and the peninsula affords great opportunities for casual dining and discussion during meal preparation. To the left of the entry, resides the opulently scaled and appointed master suite, with a huge sleeping area, walk-in closets and a spa-like bath, as well as the dedicated laundry room. This suite is a delightfully private and restful retreat, with wainscoting that compliments an octagonal coffered ceiling and large windows that overlook the back yard. It includes its own hallway that leads to a huge walk-in closet with vaulted ceilings and natural light that is brought in through tubular skylights and terminates at the master bath. 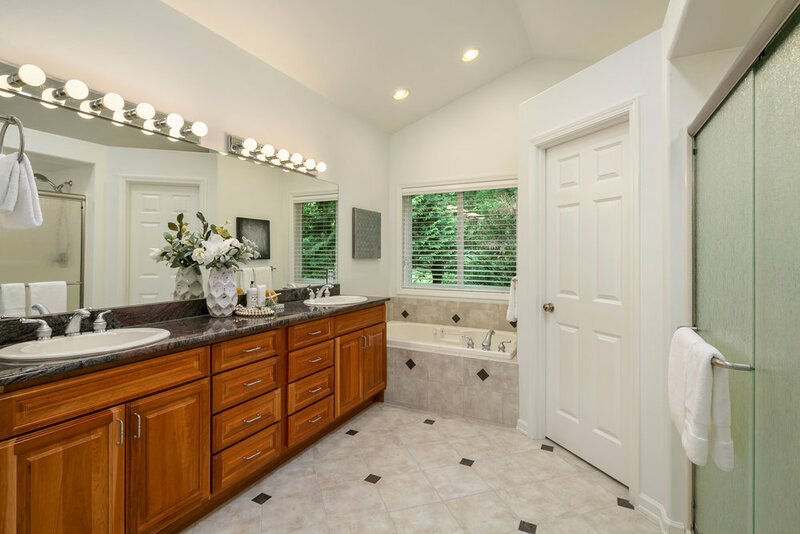 The bath is a huge oasis, clad in detailed porcelain tile and featuring a two-sink cherry vanity, with a private water closet, a deep soaking tub and a large walk-in shower. On the second level, the staircase lands in a huge open space that is ideal for casual relaxation, play or study, and which overlooks the foyer and great room. It connects to two spacious bedrooms that share a large bath with cherry cabinetry and a two-sink vanity. This is a wonderfully livable home that brings classical elegance and detail to a soaring, open and flowing contemporary floor plan. With a location deep in its community, it offers a tranquil sense of solitude and security that pays homage to its lush natural surroundings, while affording plenty of space for outdoor enjoyment. 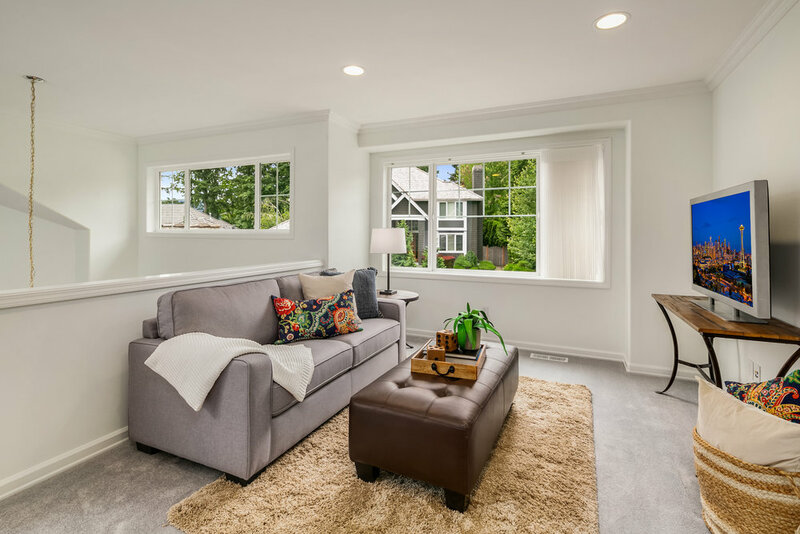 The house’s close proximity to the South end of Lake Sammamish puts it within easy reach of all the shopping, dining and entertainment that Issaquah has to offer, as well as the outdoor recreational opportunities afforded by the Cougar, Squak and Tiger Mountain nature reserves. Close access to I-90 ensures an efficient commute to Seattle, Bellevue and the Eastside tech corridor, while also placing the residence amidst numerous top-notch golf courses, award-winning schools and equestrian facilities. The house has been exceptionally well cared for, and presents a move-in ready, blank canvas for its new owners’ personal expression, collections and style.